Nearly a quarter carat of pave diamonds cover this flat heart pendant, forming a blanket of sparkle that's a sophisticated picture of a heart that's been set aglow. This 14K yellow gold pendant is a striking way to celebrate the love that illuminates your life as 15 glimmering stones are squeezed together and framed by a golden border. This sweet and fashion-savvy piece dangles elegantly from a coordinating 18-inch box chain as it effortlessly combines timeless charm and contemporary appeal. 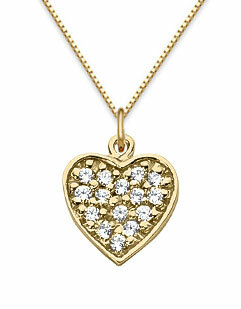 We guarantee our Pave Diamond Heart Pendant, 14K Yellow Gold to be high quality, authentic jewelry, as described above.